← Wednesday’s Word: Do you Ever Wish Jesus was More Specific? I apologize in advance for the fact that you’ll be singing this song for the rest of the day, but it’s worth it, I promise! Go ahead–I really want you to hear it, and it won’t take long, so I’ll just wait here, okay? You’re back? Oh, good. I was thinking about that song and story a lot this past week. I had some publishing news from not just one, but TWO publishers: MeeGenius is about three months behind on the Author Challenge Finalists’ books, and Sunpenny is about three months behind schedule, too, so now instead of January and March release dates, I’m now hoping that both will come out some time before the end of the school year. I haven’t been given new release dates yet. After hearing the news from not just one, but both publishers, I started humming the soundtrack from this wonderful picture book and made an astonishing discovery–I have changed quite a lot in recent years! Despite the news, I could keep singing praises to God. His plan was–is–at work, and I just don’t have to worry about it. Have you ever had an experience like that, where a situation that used to throw you for a loop just didn’t anymore? Setbacks or long silences with publishers used to send me into a tailspin of doubt and dismay. I would worry that the publisher was folding, or losing interest, or never intended to publish the book anyway. I would worry that God was trying to tell me that I hadn’t revised it enough yet, or that I needed to be somehow better prepared for the book to come out. And I’ve found at last that it was, and is, enough. The truth is, I can look back and see that at points where I was close to giving up, the book wasn’t actually ready–I wasn’t actually ready. If it hadn’t been for the delays and year-long silences by the first publisher, I never would have looked for, and found, my delightful new publisher. When I first tried submitting Sophie Topfeather to publishers, I only knew about twenty kids–now I know hundreds by name. My point is, when we can see how God has been faithful in the past, we can also trust Him with our present and future–even if there’s no end in sight to the wilderness. 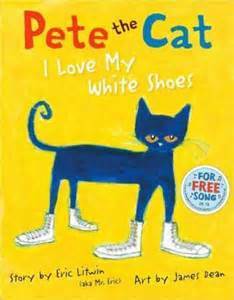 My only beef with Pete the Cat is that the author concludes that no matter what Pete has stepped in, “It’s all good.” Not true: just watch the news. However, God is good, and the Bible assures us of his measureless love. We really don’t have to be afraid. So, don’t mind me–I’ll just keeping singing my song! May this be true for you this week! This entry was posted in Faith, Sophie Topfeather, Writing and tagged Bon Voyage, encouragement, Faith, Isaiah, Pete the Cat, publishing, Sophie Topfeather, Timley, Trusting God. Bookmark the permalink.